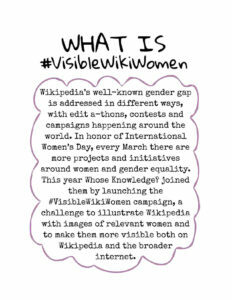 In honor of International Women’s Days, every March there are projects and initiatives around women and gender equality, many of them addressing Wikipedia’s well-known gender gap.This year we joined them by launching our #VisibleWikiWomen campaign, a challenge to illustrate Wikipedia with images of relevant women and make them more visible both on Wikipedia and the broader internet. This resource presents thoughts and reflections about the 2018 #VisibleWikiWomen campaign. It explains what is VisibleWikiWomen, why and how it was undertaken, what we achieved and learned, and how we see the future from there.